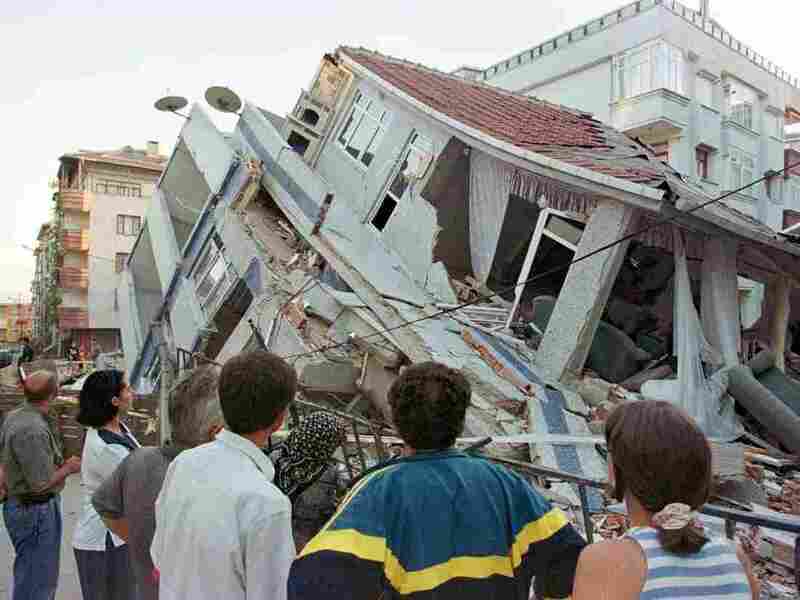 18 Years After Turkey's Deadly Quake, Safety Concerns Grow About The Next Big One : Parallels A 1999 quake killed 17,000. Experts are warning that Turkey is badly unprepared, and concern is growing since many urban green spaces meant as earthquake evacuation zones have been sold to developers. Earthquake survivors look at a collapsed building in Istanbul in August 1999. The magnitude 7.4 quake killed 17,000 people across northwestern Turkey. Before dawn on Aug. 17, 1999, one of the fault lines running beneath the Sea of Marmara began to slip and rumble. The Eurasian plate moved against the Anatolian block for less than a minute — but the quake and severe aftershocks devastated entire neighborhoods, including in Istanbul, where hundreds died. As rescue crews searched for survivors — and then for bodies — anger mounted at the shoddy construction and lack of disaster readiness that critics said made the quake deadlier than it should have been. The government, then led by Prime Minister Bulent Ecevit and a Democratic Left Party coalition, responded: Buildings were slated for strengthening; new construction standards were set. A key part of the plan was the designation of hundreds of urban green spaces as evacuation points, where people could escape collapsing buildings and other debris in the event of another large earthquake. But nearly 20 years later, many of those evacuation zones have vanished. One was adjacent to Istanbul's Freedom Park, where I recently met opposition lawmaker Gursel Tekin. He spent a decade as Istanbul's deputy mayor, including during the time of the 1999 earthquake. He says as memories of the quake faded and property values soared, the government of Recep Tayyip Erdogan, then the prime minister and now the president, began selling off evacuation areas to friendly developers. 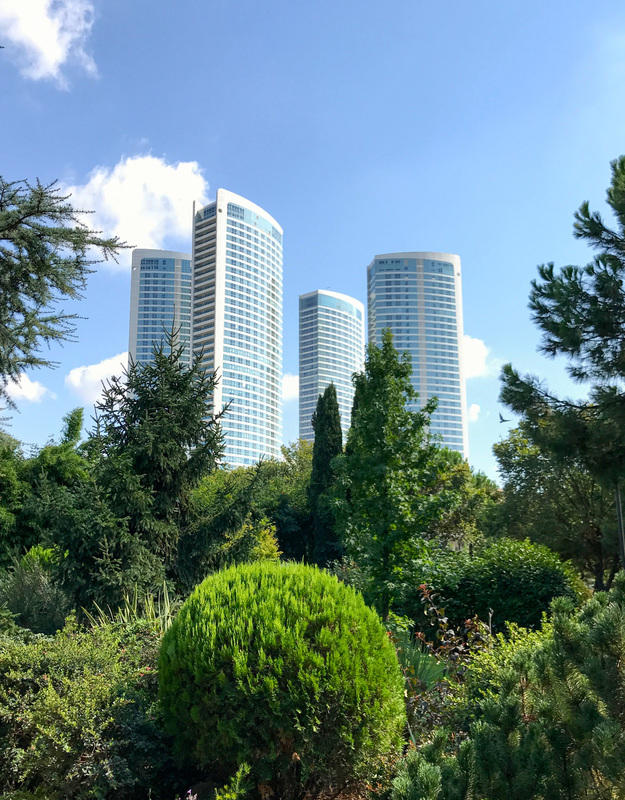 Four high rises loom over an Istanbul park. The land they sit on was designated as an evacuation zone after the 1999 quake. But it was sold to developers. Tekin points to four giant concrete and glass towers looming over the park. "This place you see in front of us was a public green space, and after the 1999 earthquake, it was designated as a public meeting area," he says. "Unfortunately, now it is only a monstrous concrete mountain." Tekin says hundreds of evacuation zones have been sold. Even top government officials have acknowledged — without holding anyone accountable — that development got out of hand. Tekin has been collecting audio clips from news broadcasts of officials — including Erdogan himself — talking about the loss of open areas. "Istanbul is no ordinary city, it is an exceptional city," Erdogan said at the opening of a mosque in Istanbul earlier this year. "But we did many wrongs to it. We made monstrous buildings and we did a great wrong to this beautiful city." Turkey's environment minister Mehmet Ozhaseki has gone further, identifying corruption as a big part of the problem. "Yes, there has been fraud and corruption and wrongdoing," he told reporters within the past year. "Our cities developed very fast in the last 15 years, and corrupt illegal zoning decisions benefited developers and angered the public." Tekin notes that the Erdogan-led government is hardly the first to favor well-connected developers over the environment. He says the park we're sitting in was nearly turned into a shopping mall 20 years ago, but loud public opposition stopped that project. Still, the current government has allowed the development frenzy to get much worse than it was before, he says, and has undone many of the earthquake readiness improvements instituted after the 1999 quake. "In 1999, the government acted swiftly after the disaster, creating earthquake meeting areas, launching a national earthquake council and dedicating tax revenues to earthquake readiness," he says. "This was extraordinary work in one year. What did this [Erdogan] government do? Close the council, spend the tax money and give hundreds of public gathering zones to their developer friends." The government insists it is working to improve Turkey's earthquake preparedness. But neither the deputy prime minister's office in charge of preparedness, nor Turkey's official aid groups responded to several requests for comment for this story. Meanwhile, an architect's union says some 7 million buildings in Turkey are still unsafe, 2 million of them in Istanbul. And scientists say another large earthquake is likely in Turkey's future. If it happens, people will need someplace safe to go.